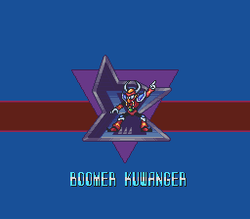 Boomer Kuwanger awaits on the top floor of a huge tower, which you must travel through. 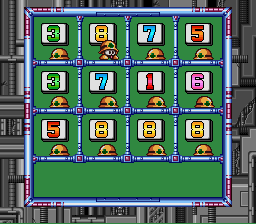 It doesn't feature any difficult enemies or sub-bosses, so it's a rather easy stage. You'll also find a heart tank which cannot be taken at first, but after you get Boomer Kuwanger's weapon, the Boomerang Cutter, you'll be able to grab it no problem. Did you ever wonder what does "Kuwanger" mean? It comes from the Japanese "kuwagata", which means "stag beetle". Jump over Hoganmer's mace and then destroy him. You start off on the underground floor of the tower. Climb up the ladders and you'll find a Hoganmer (the robot with the mace and shield). Remember to jump over its mace when it throws it, and then quickly destroy it with a fully-charged blast. 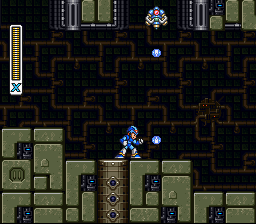 You'll also encounter a robot that travels along the walls, and quickly retreats in the opposite direction once you approach it. To destroy them, just use the Electric Spark special weapon. Wait for the laser trip wires to disappear, then run across. 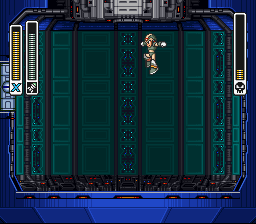 Once you get to the next floor, you'll have to deal with some annoying flying robots and some laser trip wires (which trigger the invulnerable robots hovering above to shoot you with an extremely fast laser). Destroy the flying robots if they come close, and wait for the laser trip wires to disappear, then quickly run across. Note: If you have the Buster upgrade from Flame Mammoths stage and defeated Armored Armadillo, you can charge up the Rolling Shield to shield yourself so you can run right through the laser trip wires without taking damage. 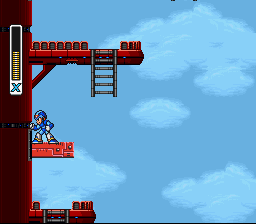 When you get to the other side, climb up the ladder and destroy the missile-shooting robots until you reach the top. Hop on the nearby elevator once you do. The start of the elevator ride: avoid the spikes! As soon as you step on the elevator, it will immediately start to ascend. At first you'll have to dodge some spikes: if you come into contact with them, it will result in an instant defeat. Dodge the flying robots as well. 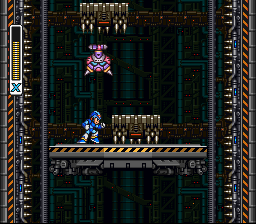 Further up, some purple flying robots will try to halt your progress. You don't have to destroy them, as you can simply dodge them and watch as they disappear off-screen. Once you get near the top, the elevator will start to slow down, and a series of spikes will appear. Dodge all of them and step outside. 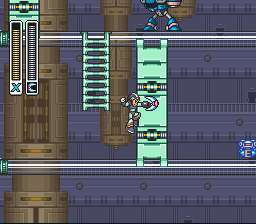 You can ride on the platforms like this or just wall dash (or jump dash) to reach the ladders. 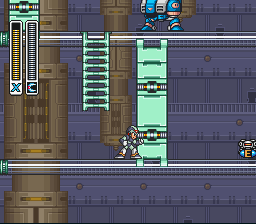 In this area, you'll have to deal with some cannons on platforms that emerge from the left-hand wall. 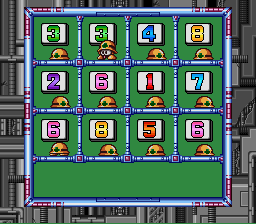 To get to the next floor, you'll most likely have to destroy the cannon and ride on the platform in order to jump to the ladder (however, it is possible to just scale the wall and wall dash to get to the ladder). 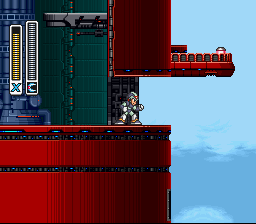 There will be gecko robots on some of the ladders, but they can easily be destroyed. 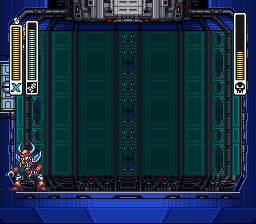 On the top floor, you'll notice a heart tank that is out of reach. As stated before, you can get this heart tank with Boomer Kuwanger's weapon, the Boomerang Cutter, or with a very precise dash jump off the wall. However, you can also reach it with a charged Shotgun Ice shot if you got the arm cannon upgrade from Flame Mammoth's stage. In the final part, there will be cannons riding on flying machines and some more of those wall scaling robots from the first part of the stage. You can destroy the cannons and ride the machines, or you can just scale the walls in order to reach the ladders. Step inside the dungeon once you get to the top floor. Boomer Kuwanger is one of the easiest bosses in the game, even on par with Chill Penguin, if you use the Homing Torpedo. He only has two basic moves: he'll either throw his boomerang at you, which travels in a circle, or he'll become invisible and spawn at a random location (which will most likely be near you). He also moves very quickly by gliding across the ground. However, the only thing you have to do is scale one of the walls, hide in the corner, and shoot a Homing Torpedo. 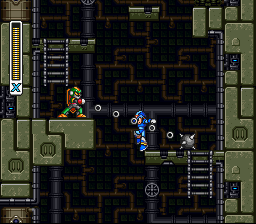 The missile will find the Kuwanger no matter what, so just keep firing it while you're hiding in the corner. If he comes too close to you, simply dash from the wall and do the same thing on the opposite wall. Repeat this strategy until it's destroyed (which doesn't take long). Boomerang Cutter! This fires a boomerang at enemies, which will travel in a circle in front of X. It will circle up if you fire from the ground and down if you fire in midair. Three of these can be fired in rapid succession and the boomerangs can even be used to grab items out of reach. Plus, even if you miss, if you catch your boomerangs, you can regain some of your weapon power. Stand here and use the Boomerang Cutter. 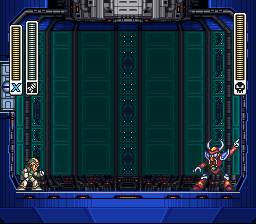 Go back to Boomer Kuwanger's stage and head to the top floor of the outside area. Equip the Boomerang Cutter, stand in the position shown in the picture, and shoot one boomerang. It will grab the heart tank and bring it to you... easy as that! It can also be obtained with a charged Shotgun Ice platform, if you got the arm cannon upgrade from the Flame Mammoth stage. 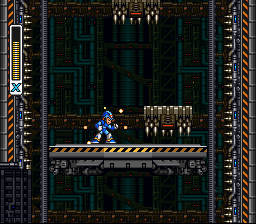 Head back to Spark Mandrill's stage and follow the ladders downwards until you reach a dead end. Run to the far right, against the wall and you'll see the Sub Tank lodged inside. Use a midair Boomerang Cutter shot to pick up the tank from afar. Jump up and shoot the Boomerang Cutter. This page has been accessed 131,224 times.